In 1983, Brenda and Paul Liistro purchased an undeveloped lot. The terrain featured 50-year-old cherry, oak, maple and deciduous trees. They decided to build a Tudor-style home. Construction began in January 1984, and they moved into the house that August. Sod was installed. However, not a single shrub or border garden was planned. The idea was that they would learn, design, plan and plant an English herbaceous garden and do most of the work themselves. During the winter of 1986-87 the couple took courses, read books and attended seminars on English gardens. They designed the layout of the beds near the house and began to amend their soil, install irrigation systems, and put down mulch to keep down the weeds. The hard part was now to begin: to learn each plant’s specific habitat, its tolerance to sun and shade, and its bloom cycle. Over the years their property has expanded and shrubs, specimens and architectural features were added. The Liistros have designed, planted, and maintained their garden. Seasonal cleanup, edging, mulching, and lawn care are handled by a lawn service. In 1995 their garden was first featured on the Hidden Garden Tour. Many are interested to see how the garden has evolved over the past 22 years. 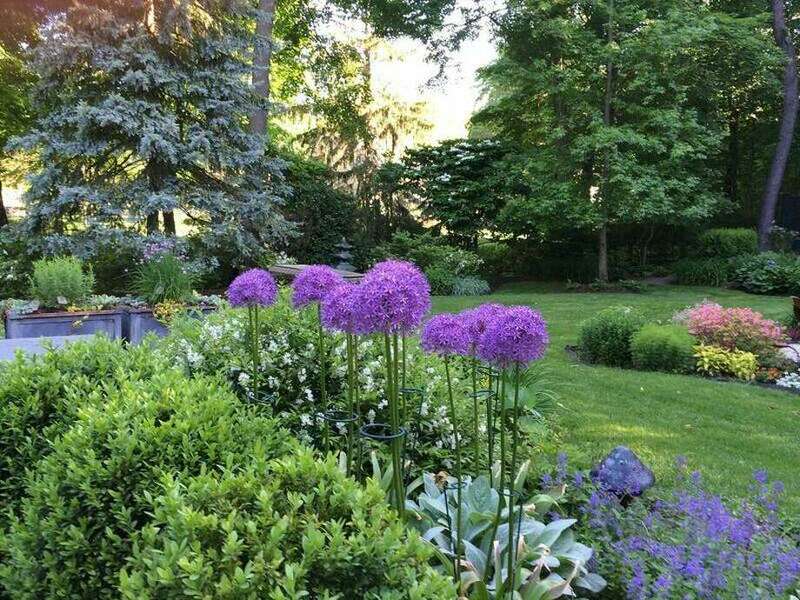 The Liistro garden, as well as three others in Westport, one in the Southport section of Fairfield and one in Easton will be highlighted on the 26th annual Hidden Garden Tour of the Westport Historical Society on June 11. All of the gardens featured have been lovingly hand tended by their owners, as all the owners are home gardeners. On June 11 the annual Garden Marketplace at the Westport Historical Society, featuring handcrafted garden ornaments and unique gifts, will also be available. For tickets and information, visit westporthistory.org. Margaret Mazer for the Westport Historical Society.